Michael Macedonia, portraying Abraham Lincoln, during Abraham Lincoln Remembrance Day in Peekskill, Feb. 20, 2016. History is a powerful teacher. I don’t know who, but someone must have said that. And isn’t it also true that history repeats itself? I was reminded of this when I received an invitation to an event taking place on Saturday, February 16, 2019. It is a re-enactment of Lincoln’s brief visit to Peekskill more than 150 years ago. He didn’t have much to say then. Lincoln arrived at the Peekskill, New York train depot on South Water Street at 2pm, stepped onto a baggage truck and used it as his speaking platform. From there he greeted the gathered crowd, some 1500 people, which was half the population of Peekskill at that time. 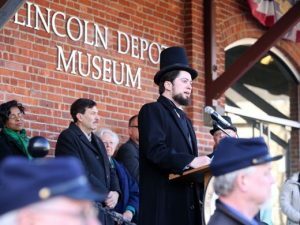 The sponsors of the reenactment–the Lincoln Depot Museum, whose President is County Legislator John Testa, and the Lincoln Society in Peekskill–hope for the same size crowd as in the past for this Lincoln Remembrance Day. Located by Peekskill Bay on the east bank of the Hudson River, The Lincoln Depot Museum is a 3,000 square foot 19th Century freight and passenger rail depot. In my youth, I might have thought it silly to stage an actual repeat of a historic occasion in full costume and regalia. But in hindsight, which always seems to be 20-20, I’m glad the sponsors continue to remind us – even for just a day– of Lincoln’s historic train ride from Springfield, Illinois to Washington D.C. to assume the presidency in 1861. It reminded me, and perhaps it will remind you too, of his dedication to the principle that all men are created equal. As the frequent challenges to this concept escalate in our current world, I’m okay with a historian donning a stovepipe hat to remind us of our social justice legacy in America.